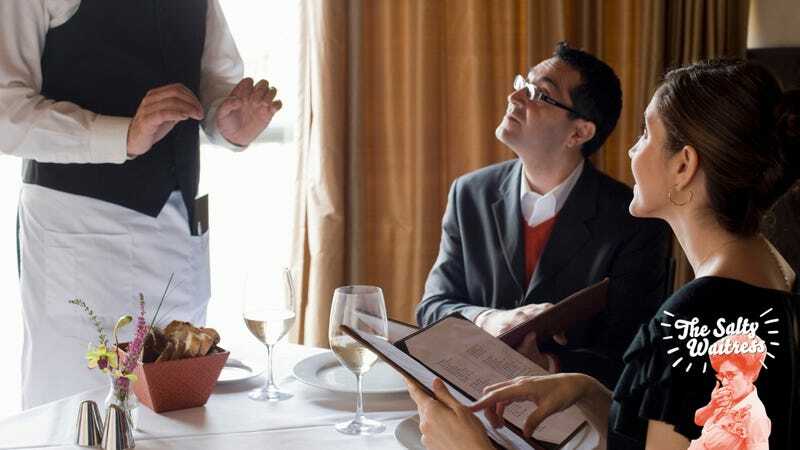 Dear Salty Waitress: I’m a server at a mid-price, upscale casual restaurant, and I love my job. Recently, management has been pushing for us to boost sales by “suggestively selling.” The examples they give are saying things like “Can I get you one of our signature cocktails or local draft beers?” and “Make sure you save room for our oven-warmed brownie sundae!” Instead of the casual “Can I grab you any drinks?” and “Did you want to check out the dessert menu?” that I usually go with. For me, above all else, serving is about making the guests feel welcomed and helping them get the meal that’s right for them. I understand of course that it’s a business, but I’m afraid of giving someone a terrible experience by up-selling too hard! Is there a middle ground where I’m selling more, but not because I’m pressuring my customers? Unless you’re like, a Buddhist monk or something, we’ve all had to do things for our jobs that we’re not crazy about. It can be uncomfortable at first, but unless those things involve ethical shadiness, illegal activity, or straight-up rudeness, sometimes we have to bite the bullet to keep the paychecks coming. It’s not always fun, but that’s life, toots. You said you like your job a lot, so presumably you want to keep it. That might mean you have to make peace with management’s request here. I do think you can find a middle ground to absolve your guilty conscience. Is a cocktail or a dessert on the menu that you objectively think is delicious? Then you are, in fact, suggesting something that could make your guests’ meal more enjoyable. It’s a way to genuinely recommend something: “Were you considering drinks at all? I think our bartenders make a great Moscow Mule” or “Interested in dessert? The brownie sundae is our most popular.” You’re not really pressuring, you’re just adding some extra information that might nudge them to order an extra something. Diners have pretty much grown to expect questions like these when they go out, and it’s not hard to turn down those suggestions if you’re not feeling them. Honestly, if your customers can’t politely say “no” to either of those, they’re a bunch of weenies. Bite the bullet, try the upsell, and console yourself with the few extra bucks in your paycheck.